Trying to find Music Hall, Carver Hall or a place to park? Looking for general information about ISU? You've come to the right place. Try the links below, or contact us for more information. Parking at Music Hall and Carver Hall is extremely limited. 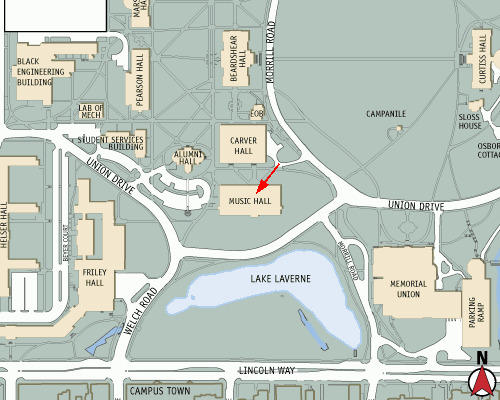 Visitors may find easily accessible parking at the Memorial Union Parking Ramp on Lincoln Way which is immediately east of the Music Hall and Lake Laverne. See the map below.